“Performing Arts takes us deep into ourselves and help us forge oneness with the world”, said Mr. Muzaffar Ali. Speaking at the inauguration of the National Inter-University Theatre Competition, Dr. Muzaffar Ali, an eminent theatre personality and film maker, highlighted the significance of performative arts to create opportunities for sharing human experiences. He congratulated Jamia Cultural Committee for organizing the 4-day National Inter University Theatre Competition that has drawn participants from all over the country. He spoke of Rumi’s (13th Century Persian poet) world-view that believed in creating a universe without barriers and hoped that the students would imbibe the spirit of togetherness through creative articulations. Later, speaking on the occasion, Prof. Talat Ahmad, Vice-Chancellor, Jamia Millia Islamia (JMI) expressed his happiness to have an illustrious person like Mr. Muzaffar Ali as Chief Guest in Jamia. He felt that such cultural events bring students together and create opportunities for learning so that the students as leaders of tomorrow can take informed decisions for the nation. Earlier, Prof. Tasneem Meenai, Dean Students’ Welfare, JMI welcomed the Chief Guests and the participants to the Inaugural Session of the Cultural Festival “Josh Vihangam” and talked about the inspiring work that was being carried out by Mr. Muzaffar Ali under the aegis of Rumi Foundation for promotion of sufi-culture and heritage of Awadh. 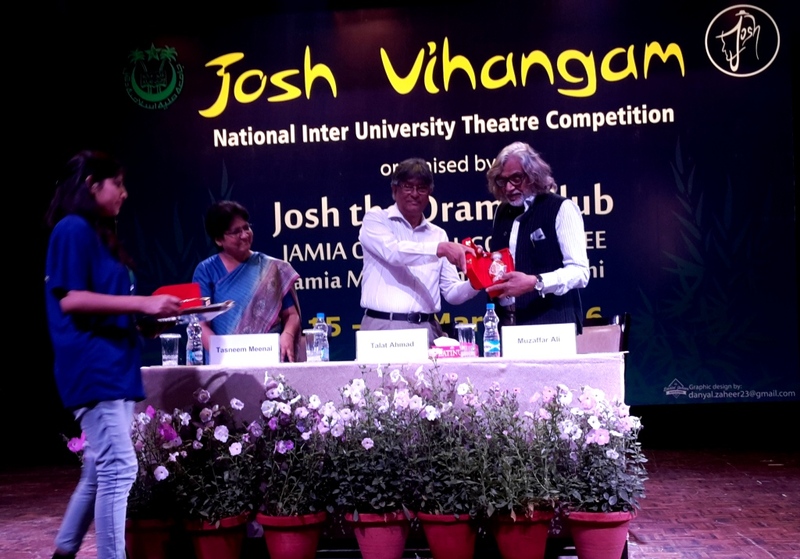 “Josh Vihangam” is a 4-day National University Theatre Competition from March 15-18, 2016 being organized under Josh – the Drama Club of Jamia Cultural Committee, JMI. There are 13 teams from various academic institutions including from Gujrat University, Kurukshetra University, University of Rajasthan, AMU among others who are competing with each other to showcase their theatrical accomplishments.